On February 25, 1925, Speaker of the House Norman K. Lyman of Hilo introduced a resolution requesting the governor to set aside 50 acres of land at Waiakea for a landing field. This was amended to 100 acres the following day by the Aviation Committee. A resolution was also introduced authorizing Territory officials to use convict labor to level the land for the landing field. Governor’s Executive Order No. 186, dated April 2, 1925 set aside 100 acres of land in Keaukaha, Waiakea, South Hilo for an aviation landing field under the control and management of the Board of Supervisors of the County of Hawaii in accordance with Concurrent Resolution No. 10, Legislative Session of 1925. Act 18 of the Session Laws of 1925, signed April 8, 1925, appropriated $10,000 for the expenses of transportation, housing and feeding of Territorial prisoners to be used in the development of an airport at Waiakea. As the appropriation did not provide for the purchase of any equipment, the prisoners were greatly handicapped in making any headway in clearing and leveling the ground. Work on Hilo Airport began July 17, 1925. Six county prisoners were joined by 40 Oahu convicts upon the completion of the Waiakea Prison Camp buildings. Work to clear the airport using 46 prisoners and hand tools donated by the county began on September 8, 1925. By the end of 1925 most of the 100 acres set aside for the airport had been cleared and graded by the prisoners. A 400 by 2,000 foot field was surveyed heading into the prevailing winds at a cost of $139.08. On April 13, 1926, the Hilo Chamber of Commerce adopted a resolution to use the dredging spoils from the Hilo breakwater project as top dressing for the airfield. The U.S. Army Corps of Engineers agreed to a study to see if this was feasible. 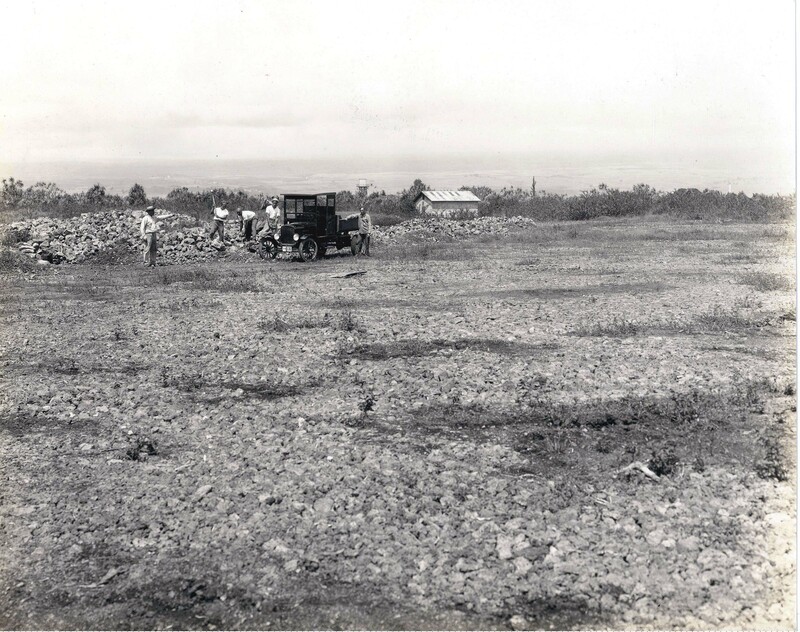 By mid-July 1926, 11 acres of the Hilo Airport had been leveled. Progress was slow since the prisoners had only picks and shovels to break up the large rocks and fill in the deep lava crevices. Prison labor problems began on August 5, 1926 when the prison camp cook escaped. He was found and returned to the camp. Four more prisoners eluded a guard and escaped on October 3, 1926 and after capture were sent back to Oahu. On December 6, another prisoner escaped and he was found and returned. The escapes and captures continued. By March 1927, 14 acres had been cleared and leveled by the prisoners. A move to abandon the project and return the prisoners to Oahu brought protests from the Hilo Chamber of Commerce. The first commercial flight to the Big Island took place when Martin Jensen piloted the Lewis Tours aircraft Malolo into a perfect landing at Hoolulu Park on a flight from Kahului. The first passengers on this historic flight were Mr. and Mrs. Walter Eklund. Act 277, Session Laws of 1927 made an appropriation of $25,000 to cover expenses of transportation and housing prisoners detailed to work on the airport at Hilo, and for the development and improvement of the airport. These funds were placed under the authority of the Attorney General. Problems with the wording of the bill delayed the necessary equipment so local businessmen donated tools, a railroad car and tracks for the railroad car. The clearing and grading of the airport proceeded rapidly when the tools became available. On July 2, 1927 the Chamber of Commerce lobbied the Governor to speed up work on the airport. Two weeks later 15 additional prisoners arrived in Hilo to work on the project. Funds for tools and equipment were available and picks, shovels and crowbars, a roller and a dump truck were ordered. On July 6, 1927, the newly appointed Territorial Aeronautics Commission approved the hauling of dredging material from the vicinity of Hilo Wharf to the Hilo Airport. From August 4 to September 8, 1927, enough coral was deposited to blanket an area 200 feet by 840 feet, suitable for an emergency landing field. Telephone poles and wires were relocated and the county road roller was brought in to level the runways. A new access road was begun and eight more acres were cleared by the convicts. In the minutes of the TAC meeting August 11, 1927, it was noted that, “The work on the Hilo Airport is progressing very nicely. Mr. David K. Richards, jailor on duty at the Hilo Airport, has 36 prisoners at work on the airport and they deserve much credit for the work they are doing. The power and telephone companies have agreed to remove their wires from the airport so as not to interfere with the planes.” The Attorney General was requested to purchase 36 raincoats for the prisoners at the airport. It was estimated that planes would be able to land on a 1,000-foot runway in a month. Twelve more prisoners were sent to Hilo on October 29, 1927, bringing the total to 48 available to work on the airfield. The access road was completed on November 9. The airfield now stretched approximately 1,000 x 250 feet and consisted of coral dredged material. A road was being built so that the dredged material would not have to be transported so far. The airport was considered large enough for any plane in the Territory to land on. In February 1928, Major Clarence M. Young, then Secretary of Aeronautics, U.S. Department of Commerce, came to Hawaii to inspect aviation facilities and promote commercial aviation in the Territory. On February 11, 1928, Major Young was flown to Hilo in the Bird of Paradise for the purpose of dedicating the new airport. This was the plane that Army Lts. Lester Maitland and Albert Hegenberger used in making the first successful flight to Hawaii on June 29, 1927. The Army and Navy sent formations of planes to Hilo for the occasion, which was attended by many Island dignitaries. The airport consisted of a landing field as described above. There were no buildings constructed as part of the airport. In its FY 1928 Annual Report, the TAC reported that 100 acres had been set aside for an airport for the City of Hilo on an excellent site at Keaukaha, Waiakea, South Hilo. Owing to the constant northeast trade winds, it was found desirable to slightly change the direction of the field so on May 16, 1928 41.45 acres was added by Executive Order 334. Work was slow, but progressed steadily for more than two years by prisoner labor under the direction of the Attorney General and High Sheriff. In October 1928, the Hilo Chamber of Commerce suggested to the TAC that the runway at Hilo Airport be lengthened to 10,000 feet. The Commission agreed that 87.92 acres of additional land that was outlined on a blueprint in possession of the Commission be acquired. They reasoned that Hilo needed a slightly longer runway than the other fields owing to the lack of wind. The blueprint showed the completed area of the runway as of November 5, 1928 to be 2,070 feet long by from 400 to 600-feet wide. The prisoners were working on the southern end of the airport. A wind vane was erected at Hilo Airport in November 1928 and monthly reports of wind velocity were collected. 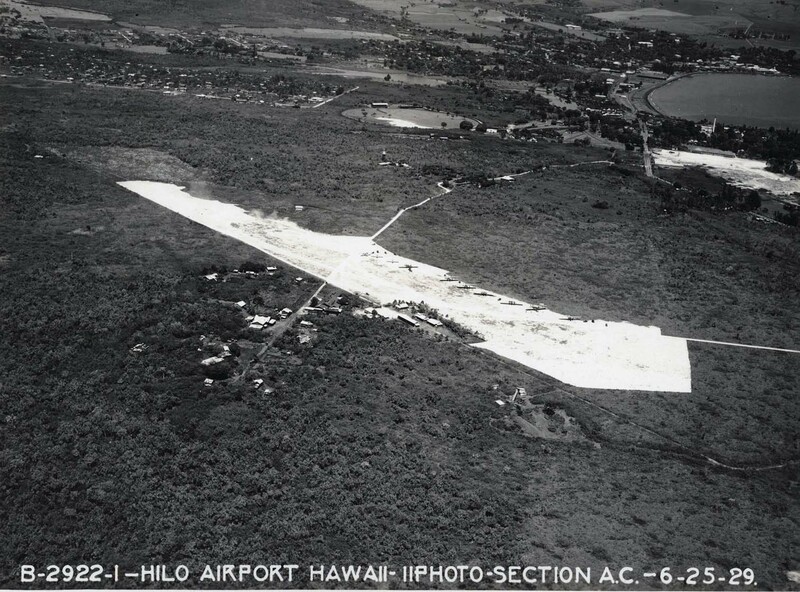 As of February 2, 1929, the runway at Hilo was 2,500 feet long with an average width of 300 feet. Act 129, was signed on April 30, 1929, appropriating $10,000 to cover the expenses of transportation and housing prisoners working on the Hilo Airport, as well as providing tools to do their work. The largest inter-island flight of airplanes in the history of aviation in Hawaii took place on October 1, 1929 when 18 sea and land planes from the Naval Air Station at Pearl Harbor flew to Hilo. The flight was for training personnel, recreation and the investigation of landing places for sea and land planes on the Big Island. The minesweeper Pelican went to Hilo in advance of the planes as tender to the aircraft. It assisted with the berthing of the seaplanes in Hilo Harbor. The planes carried about 80 persons. One plane was forced down by engine trouble a few miles outside of the bay but was towed in by the USS Pelican. Fourteen of the planes were seaplanes and the others were land planes which landed at Hilo Airport. In November 1929, Inter-Island Airways (later to be named Hawaiian Airlines) asked that hangar space be reserved for them on the northwest side of the present field and the present prevailing-wind runway. Until such time as their hangar was actually built, permission was granted for construction of a small building which would join their hangar when completed, to house the operating manager, provide room for selling tickets, and a small room for conveniences. Two Inter-Island Airways S-38 amphibians made pre-inaugural flights to Hilo on October 29, 1929, piloted by Lt. Cover and Charles I. Elliott, chief pilot for Inter-Island. Passengers on these planes were: J. P. Cooke, F. O. Boyer, E. L. Peacock, Mrs. Rufus Hagood, Miriam Holloway, R. P. White and Stanley C. Kennedy, President of Inter-Island. Inter-Island Airways began the first regularly scheduled passenger service between the islands on November 11, 1929 using Sikorsky S-38 amphibians. The fare was $32 between Honolulu and Hilo. Inter-Island Airways’ terminal was dedicated at Hilo Airport on March 22, 1930. The U.S. Weather Bureau established a weather reporting station at Hilo in July 1930. This step constituted the first expenditure of federal money in Hawaii in the interest of commercial aviation. Act 87, RLH 1931, appropriated $10,000 to continue the work by prisoners to develop the airport. Additional funds ($7,500) were appropriated for expenses of or in connection with the Waiakea Airport Prison Camp in 1932, $5,000 in 1933 and $10,000 in 1935. By 1935, Hilo Airport was composed of a grassy coral and a filled area with two runways along the lines of the prevailing winds. There was a prison camp located on the field and maintenance as well as development of additional areas was carried out with this labor. The principal need at this field was a greater improved area and paved runways. The 1935 Legislature appropriated $3,000 for drilling and blasting, which could not be done by prison labor, to increase the usable area. Inter-Island Airways, Ltd. maintained an office and one hangar at the field. The Hilo Chamber of Commerce recommended grading and surfacing with coral a triangular area adjacent to the main runway extending it as far northwest as possible to meet the prevailing wind runway. A sum of $2,500 was made available by the Chamber for the work. Prior to 1937, $34,148 in Work Progress Administration (WPA) funds had been expended on the landing area. “This field is the eastern terminus of Inter-Island Airways and serves the second largest city in the Territory. The airport is roughly triangular in shape with a usable runway 2,500 feet long by 100 feet wide. Other usable length dimensions for crosswinds are 1,200 feet and 900 feet respectively. The main runway, running northeast-southwest, is the one used most of the time. Surface is coral fill covered by grass and moss which, when wet, becomes exceedingly slippery. Under the worst conditions the use of brakes is ineffective on the short runways, if not actually hazardous. A high tension line extends across the southwest approach to the northeast-southwest runway, and a house is being built on property adjoining the airport at the northeast end of the runway. Under the present program it is proposed to pave the northeast-southwest runway 3,000 feet long by 100 feet wide after extension is made to the southwest. It is also proposed to clear all approaches and extend the north-south runway and the east-west runway to 3,000 feet in length. The east-west runway may be relocated and limited to 150 feet in usable width because of lack of funds. The power line is to be moved by the County and a restraining order should be obtained against property owners erecting buildings on land adjoining runway approaches. The Inter-Island hangar and administration buildings are to be moved to the west side of the field. No drainage is provided in this project. Paving is of the utmost importance and should be given priority. “Since all the usable portion of the field has been graded previously and excellent material for additional fill is close by, the cost of extension will not be great. In addition, the County is contributing crushed rock from its own quarry as well as trucks, blades and other road machinery. $4,500 worth of oil has been purchased and it is estimated that the total cost to the Works Progress Administration will be about $29,000. The project was started in December and is approximately seven percent complete. “It is recommended for further improvement to give preference in the following order of priority.Pave all three runways to the full distance of their respective lengths and 150-feet wide. Install lights according to BAC specifications. As soon as field has been passed by the air line inspector, application should be made to the Air Navigation Division, Bureau of Air Commerce for a radio range installation. The application should be made jointly by Inter-Island Airways and the Territory. Construction of a suitable administration building and parking area. “It is recommended that maintenance of all fields, and most particularly that of Hilo, should be mandatory as a consideration for the permanent improvements made.”Superintendent of Public Works undertook an accelerated airport development program with WPA funds in 1937. From 1937 to 1941, $261,613 was invested at Hilo Airport. In 1941, the Civil Aeronautics Administration contributed $314,000 of National Defense Funds to this development. Grading on the field was approximately 20 percent complete by mid 1937. In 1938, approximately 60,000 cubic yards of lava rock material was moved to the airport. Runway 1 was extended 3,600 feet long by 300 feet wide and Runway 2 was extended 1,900 feet long by 300 feet wide. Runway 3 was extended an additional 800 by 300 feet roughly graded south of Runway 1 which gave a length of approximately 2,000 feet. Runway 1 was paved 2,550 feet by 100 feet. It was recommended that Runway 2 be graded to 2,600 feet long and paved to 2,500 by 100 feet; the paving on Runway 1 be extended to 300 feet to meet paving on Runway 3; and that the grading of Runway 3 be extended to give a total length of 3,000 feet. It was also recommended that the prison camp be moved from its present location to a location south of the Hawaii Tuna Packers and the Hilo Fertilizer company lands, and on the moving of these buildings, that the Inter-Island Airways office and hangar be temporarily moved south to clear Runways 1 and 2. On the moving of the Puumaile Home in December 1939, this section of land was acquired for the enlargement of the Hilo Airport. Trees were cut and Runway 2 extended approximately 900 feet. No appropriation was made by the 1939 Legislature for Territorial airports, so all construction ceased during the 1939-1941 biennium as only the Aviation Gasoline Tax was available. In 1938 the tax amounted to $13,599. Inter-Island Airways, Ltd.’s office and hangar were moved from Runway 2 to a temporary location parallel to Kamehameha Street in 1939. This allowed Runway 2 to be used to a length of 2,500 feet. Runway 3 was graded 3,000 feet long by 300 feet wide and was now being used. Inter-Island Airways spent $600 on airport station improvements in 1940. A dedication ceremony for the renovated Hilo Airport was held on May 2, 1941, marked by the departure of an Inter-Island Airways Sikorsky plane. E. M. Desha dedicated the airport with a wreath and speech. Highlight of the ceremony was the delivery of pouches of airmail at the airport containing thousands of airmail covers bearing a special commemorative Lei Day and Hilo airport cachet. In 1941 the CAA completed radio range beacons and a weather station at the airport. Act 35, Special Session 1941 appropriated $7,500 for the purchase of land at Hilo Airport, $6,000 for a control tower and $12,000 for an airplane hangar. According to the Department of Public Works’ Annual Report of June 30, 1941, $125,243 of Territorial money had also been spent on the airport from 1927 to that date. At the outbreak of World War II, Hilo Airport was taken over by the Army Engineers, and an Air Corps fighter squadron was stationed there. U.S. Army Engineers constructed military installations and continued the expansion of runways, taxiways, and parking aprons. In 1943, the Navy moved onto the field under an agreement with the Army and began construction of a Naval Air Station. The construction of the Naval Air Station started shortly thereafter on all the necessary facilities to base and train two full air groups. While the Navy had more extensive installations and greater use of the field, the Army Air Corps continued to operate the control tower, and, from their own reservation, serviced a sizeable transport operation conducted by the 19th Troop Transport Squadron. The Naval Air Station also serviced a similar Navy activity. Civilian passenger service continued under the authority of the Army. The name of Hilo Airport was changed to General Lyman Field by Joint Resolution 5 of the Territorial Legislature on April 19, 1943. The field was named to honor Brigadier General Albert Kualii Brickwood Lyman who was born on the island of Hawaii on May 5, 1885, was educated at Kamehameha and Punahou Schools, and the West Point Military Academy. General Lyman was the first man of Hawaiian blood to be appointed a brigadier general of the United States Army. He died in Hawaii in the service of his country on August 13, 1942. In 1944, the Post War Planning Division of the Territorial Department of Public Works recommended a number of projects to improve Hilo Airport when the War was over and the Territory would presumably get the airport back. These included extending the existing north-south runway from its present 3,200-foot length to 5,000-feet, 800-feet northerly and 1,000 feet southerly; grading the runway 500-feet wide and paving it 200-foot wide. They recommended asphalt concrete paving three inches thick. They recommended the installation of boundary and contact lights, fencing, erecting an administration building approximately 40-feet by 100-feet made of hollow tile walls and a frame roof. Up until July 1944, approximately $2.7 million had been spent on Hilo airport by the Army, Navy and Territory. The East-West runway was 6,500-feet long, graded and paved 500-feet wide. The Northeast-Southwest runway was 6,000-fet long, graded 500-feet wide and paved 200-feet wide. The North-South Runway was 3,000-feet long and they recommended it be increased to 5,000-feet to accommodate trans-Pacific traffic. The land needed for the extension was already owned by the Territory and only needed to be transferred by Governor Executive Order to the Superintendent of Public Works for airport purposes. The estimated cost of construction of the ground facilities was $300,000 and the building was $40,000. Of the total cost, the CAA was expected to finance $300,000. The runway extension was necessary to meet CAA regulations and provide for service during Kona (southerly winds) weather. It was recommended that the extended runway be built for the operation of DC-3 and DC-4 aircraft. The Planning Report was submitted by the Governor to the 1945 Legislature for consideration, along with a request for $40,000 for the building. No action was taken on the request. After the war, military operations at Hilo Airport steadily decreased. Permission to operate General Lyman Field as a commercial airport was granted the Territory by letter from the Commanding General, Armed Forces, Mid-Pacific, dated September 30, 1946; however, operational control still remained with the Air Force pending formal cancellation of the existing lease. A settlement between the Army, Navy and Territory was being negotiated in 1947. It was anticipated that basic control would be returned to the Territorial government soon but that the Army and Navy would each retain certain facilities for the support of their peacetime activities. 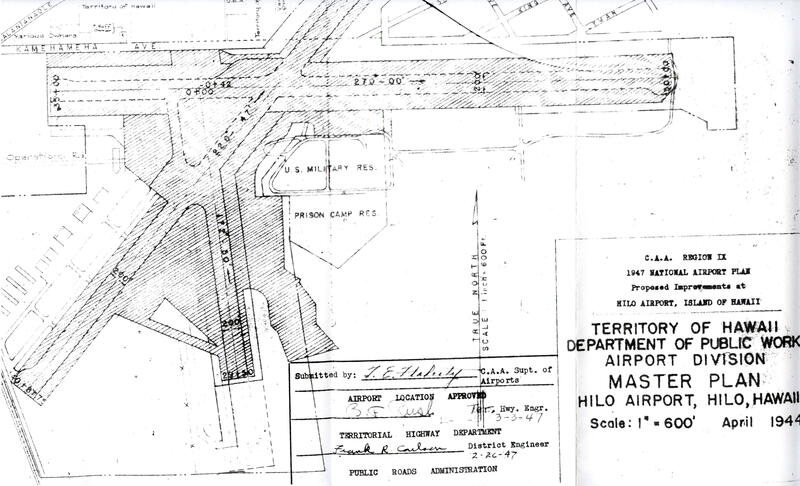 In 1947 the Superintendent of the Territorial Public Works Department proposed readapting Hilo Airport to the requirements of commercial aviation. At the time, Hilo Airport was one of the three principal centers of the Territorial Airport System. Hilo Airport was the center of all personal transportation for the people of the island of Hawaii. The airport was served by 480 scheduled flights per month by Hawaiian Airlines Ltd. and by approximately 246 round trips from Honolulu flown by non-scheduled operators. Although the airport was basically satisfactory, its layout and facilities were planned almost solely from military considerations and, in many respects, the exigencies of wartime requirements made it necessary to take short cuts in construction that needed to be corrected. The Superintendent of DPW again proposed constructing an administration and terminal building for all inter-island operators, to extend the north-south runway, to seal coat the entire paved area, to perfect the field lighting system, to properly fence the airfield, to perfect the field drainage system and to remove various revetments in order to conform to CAA clearance standards. 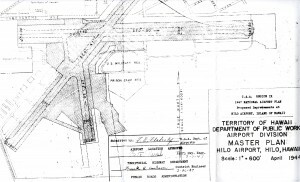 The Territorial DPW Master Plan for Hilo Airport written in April 1944 was approved by the CAA Region IX as part of the 1947 National Airport Plan. Act 32 of the 1947 Legislature, placed General Lyman Field under the management of the newly created Hawaii Aeronautics Commission on July 1, 1947. Pending cancellation of the existing lease under which the field was operated during the war, operation of the control tower was continued by Air Force personnel. This situation continued until October 1948, when operation of the control tower was turned over to the Hawaii Aeronautics Commission. Commission funds were appropriated for operation of the tower by Civil Aeronautics Administration personnel. Difficulties were encountered in the release of the airport to the Territory, but the Commission, with the help of the Delegate to Congress, succeeded in obtaining Congressional funds for control tower operation commencing July 1, 1949. No major projects were undertaken at General Lyman Field during the years 1948-1949 in view of the questionable status of the airport under the War Department lease. The Governor issued an Executive Order in May 1948 transferring two parcels of land at the airport to the Navy. Transfer of the land was not expected to interfere in the carrying out of the Master Plan for the airport. On June 15, 1948, the first commercial passenger airliner to be flown directly from Hilo to San Francisco made it in 7 hours, 48 minutes. The specially chartered United Air Lines plane carried 44 passengers. United announced that it would try to furnish additional extra sections from Hilo whenever possible. Mark E. Martin was appointed the first Superintendent of Hawaii County Airports by the HAC, effective July 1, 1948. The HAC appropriated $20,162 to operate Hilo Airport Control Tower until June 30, 1949, thereby continuing work of the Army Air Force which was scheduled to cease tower operation October 31, 1948. Hilo Airport is located on property belonging to the Territory of Hawaii and under lease to the Unites States Army Air Force. It has been declared surplus to the needs of the Air Force except for a small reservation which was previously transferred to them by Executive Order and is now in the hands of the War Assets Administration for release to the Territory. The field has two paved runways, one of which is 6,500 feet in length and the other 6,000 feet in length. Planes using this airport consist mainly of commercial operators and Army and Navy operating between the islands. Terminal facilities are housed in temporary buildings that were constructed by the Navy during the war. A master plan has been prepared which shows one terminal building to be used jointly by all passenger carrying airlines, a freight terminal and areas indicating locations for hangar facilities, aircraft parking, etc. The Control Tower was still being operated by Army Air Force personnel only during daylight hours, except by special arrangement when contact could be made for landings and take-offs during the early hours of darkness. Runway markings were completely repainted in July 1948. As part of the national program for converting radio aids for airways to static-free very high frequency operation, a very high frequency omni-directional radio range (VOR) station and an instrument landing system (ILS) localizer were installed at General Lyman Field. The VOP was operational by November and the ILS by December 1948. A blind vendor’s stand and lei stand were built in the Hawaiian Airlines Terminal in August 1948. A new taxicab plan was placed into effect on September 1, 1948. Also in September, Andrew Flying Service closed its Hilo Branch. The restrictions placed upon the GI Bill flying program by the Veterans Administration were a severe blow to all flying school operators. The Army ceased operations at Hilo Airport on October 1, 1948, and on November 1, 1948, the Air Force ceased operating the Airport Crash Station and Control Tower. Airport policemen, under arrangement with the Hilo Police Department, were placed to aid in the security and general operational control. Air traffic around Hilo Airport was particularly heavy during the second week of January, 1949 because of the volcanic eruption of Mauna Loa which began on January 7, 1949. The old terminal building used by Hawaiian Airlines during the war was renovated and rented to Trans-Pacific Airlines in March 1949. Trans-Pacific Airlines started scheduled operations into Hilo on June 5, 1949. In May and June of 1949 all suitable buildings on the airport were rented for the storage of a backlog of raw sugar created by a shipping strike. On May 23, 1949, the Legislature passed Act 368, which appropriated $300,725 for paving, improvements, plans, and specifications at General Lyman Field. An agreement was made with the Corps Construction Company in June 1949 for a quarry operation so as to accomplish excavation for the future south extension of a North-South runway. Also in 1949, considerable work was done on airport zoning because the airport was so close to the populated areas of Hilo. The U.S. Department of the Interior provided funds to carry on Control Tower operations effective July 1, 1949. Pan American Airways’ Stratocruiser flew to Hilo for the opening of the Hilo Tribune-Herald’s new printing plant on April 9, 1950. The trip was made in 49 minutes and 49 seconds, and the return flight in 55 minutes. Not to be outdone, United Air Lines’ Stratocruiser flew to Hilo for the Hawaii County Fair on April 15, 1950. The trip was made in 47 minutes and 35 seconds. Both flights showcased the airlines and the public was invited to view and board the planes. In 1950 Hilo Airport was still under lease to the War Department. However, the Hawaii Aeronautics Commission continued to perform all maintenance and operational duties. Operational control of the aircraft operating areas had been granted to the Hawaii Aeronautics Commission by the military authorities. Probably the most important development pertaining to Hilo Airport during 1950 was the Hawaii Aeronautics Commission’s decision to proceed with permanent improvements even though the airport was still under the legal jurisdiction of the War Department. It became evident that there was nothing to be gained by further delay; even after its formal return to the Territory, as the airport would still be subject to absorption by the military in case of emergency. A detailed Master Plan prepared by a consulting engineer was approved. The program gave high priority to the construction of a new joint passenger terminal. The basic maintenance and operational duties at the airport were performed by a small Hawaii Aeronautics Commission staff. All special projects were accomplished by outside contracts. The HAC recognized that, with the beginning of a permanent improvement program, an enlarged maintenance and custodial staff would be necessary. Present general duties included: routine maintenance and repairs to runways, taxiways, roads and parking areas; routine maintenance of runway lighting system, rotating beacon, lighted tetrahedron and obstruction lighting; routine maintenance of buildings, and overall administration, operation and security of the entire facility. The Hawaii Aeronautics Commission approved the expenditure of $125,000 for fencing of certain hazardous open areas around the airport. Early in the year a plant nursery was started to provide potted plants for the terminal building and slips for an outside beautification program. The Civil Aeronautics Administration began operating the Hilo Control Tower (with Federal Funds) on a permanent basis, beginning July 1, 1949. This service was a great asset to the airport and increased the safety factor tremendously. A new Flower Shop concession started operation in December 1949. A new airport restaurant concession started operation in December 1949. A new automobile parking lot was graded and paved to accommodate airport employees and airport restaurant customers. Project was completed in December 1949. A power driven poison spray unit was purchased and put into service in December 1949. The U.S. Weather Bureau completed a new building at the airport in July 1950. Limited operation was started immediately and by March 1950 they were conducting a full scale observation and reporting program. The new VOR Station was completed and commissioned by Civil Aeronautics Administration in January 1950. A 45,000 barrel fuel tank was rented to the Flintkote Company in March 1950. All buildings under HAC jurisdiction were reroofed in March 1950. In May 1950 the Air Force and Navy brought in special type planes for public inspection; this was in recognition of Armed Forces Day. There were Neptune Patrol Combers and a Stratofreighter. Two-way VHF radios were installed in three vehicles. All buildings under the HAC jurisdiction were repainted to conform to standard requirements. Project was completed in June 1950. Extensive repairs and modifications were made on the Hilo Control Tower so as to meet Civil Aeronautics Administration requirements. Project was completed in June 1950. On July 24, 1950, the HAC approved expenditure of $258,000 for construction of a new Hilo Terminal Building with first priority to be given to the project, and $35,000 for the acquisition of land at Hilo Airport. On October 23, 1950, the HAC appropriated $5,000 for the landscaping at Hilo Airport in accordance with the Master Plan. Plans for the Hilo Terminal were discussed by the HAC at a meeting on December 28, 1950 and it was agreed that the size of the building was not proportionate to the needs of the community and traveling public and that it should be cut down considerably; the design to remain the same. The Commission agreed that a sum not to exceed $400,000 be expended on the entire Hilo Airport project. During 1951, extensive improvements to the main entrance and access road to Hilo Airport terminal area were completed. A Jeep crash fire truck was put into operation. Act 63, RLH 1951, ratified an agreement between Hawaii County and the HAC to provide the labor and materials necessary to repair the surface of the airplane landing fields at Kamuela and Upolu Point and to relocate the entrance road to General Lyman Field, as well as other necessary general rehabilitation work at all three sites. In exchange the HAC would reimburse the County for these costs. By mid-1951, the airport was served by an average of 10 scheduled commercial passenger flights daily and two scheduled commercial freight flights daily. In addition there were numerous special flights by scheduled, non-scheduled and military carriers. The average daily number of operations at Hilo was 100. There were 11 privately owned airplanes based at Hilo Airport. CAA Air Traffic Control facilities are operated 15 hours each day in space provided and maintained by HAC. CAA Communications facilities were operated on a 24-hour basis in space provided by HAC. The U.S. Weather Bureau operated on a 24-hour basis. The CAA operated a low frequency radio range station and a VHF range station on a continuous basis. The Airport was designated as an International Alternate Airdrome and was used as such on six occasions during 1950. In each instance the flight originated on the U.S. mainland destined for Honolulu but landed at Hilo because of fuel shortage or engine trouble. Extensive improvements were made to the main entrance and the access road to the terminal area. This work was done by the Hawaii County Department of Public Works at a cost of $26,720.14. The project was completed in April 1951. Extensive fencing was installed at a cost of $26,282. About 16,000 linear feet was completed and funds and materials were on hand to install about 8,000 linear feet more. A land clearing project was carried out which greatly improved the air approaches to all runways. On October 11, 1951, the CAA, Weather Bureau and Department of Public Works approved the construction plans for a new Terminal Building at an estimated cost of $250,000. Presidential Executive Order dated December 13, 1951 transferred the authority of disposal of the airport to the Department of Defense, which in turn passed the authority to the Department of Army. This change in authority required a change in the document to show the Army as the agent in authority in place of the Corps of Engineers. The CAA agreed to help expedite the land transfer to the Territory. On April 8, 1952, the airport was returned to civilian control by the surrender of leases, easements, licenses and permits and improvements were transferred to the Territory by the Federal government. The Hawaii National Guard requested on May 26, 1952 that a certain small segment of land occupied by the National Guard, on which there were five or six National Guard buildings which were not being used by the HAC at Hilo, be left out of the Executive Order transferring additional land to the HAC. No decision was made. A groundbreaking ceremony was held on July 16, 1952 for the new $247,963 passenger terminal. David Furtado, Big Island member of the Hawaii Aeronautics Commission turned the first piece of sod with a golden spade decorated with red and white ribbons. Contractor was S. K. Oda Co. of Hilo. The new building was expected to house both Hawaiian Airlines and Trans-Pacific Airlines which previously maintained their own terminals. The terminal would be the largest and most modern structure of its type in the Territory thus far contracted for. A new maintenance area, consisting of five buildings and a large maintenance yard was constructed. A contract was let for installation of high intensity lights on Runway 8-26. A contract was awarded to Theodore A. Vierra for architectural services for construction of a freight terminal on December 17, 1952, at a cost of $7,400. In March 1953 bids were opened for the construction of roadways, aprons and parking area, followed by the opening of bids in April for the freight terminal building. In May 1953 bids were requested to construct an airplane hangar. By mid-1953, the airport was served by two certificated interisland carriers and one non-scheduled overseas operator which made one flight per month direct from Hilo to California. Records show that for a typical month there were more than 200 passenger flights. A huge crowd from Hilo and vicinity witnessed the dedication of the new $600,000 administration and terminal building at the airport on December 5, 1953. The dedication program featured talks by government and airline officials, public inspection of the new terminal facilities, aircraft exhibit and free airplane rides in private aircraft. Hilo’s new air terminal marked another milestone in the growth of the aviation industry in the Territory. “The new building was by all standards the finest civilian air terminal in the Territory, even though it was not the largest. Its design was functional, yet incorporated decorative features wholly in keeping with the Big Island atmosphere. Luxuriant indoor patios gave a tropical touch which distinguished the Hilo terminal from all others,” reported the Honolulu Star Bulletin. The installation of high intensity lighting system for Runway 8-26 and a standby power generator at General Lyman Field were completed in February at a cost of $176,637. By June 1954, General Lyman Field was served on a scheduled basis by Hawaiian Airlines, Ltd. and Trans-Pacific Airlines, Ltd., as well as non-scheduled operators. It included a passenger terminal, freight terminal and parking area. It had paved runways, taxiways and parking aprons; a lighted- free-swinging tetrahedron; a fuel truck available from Hilo; high intensity lights on Runway 8-26, a CAA Communications and Control Tower, rotating beacon, and omni-range beacon. The HAC employed 18 people at the airport. The installation of high intensity lights on Runway 8-26 started on November 4, 1954 at a cost of $153,076. A steel frame and corrugated iron hangar for small planes was completed in Hilo at a cost of $20,119 on May 9, 1955. Due to the amount of military traffic through the airport due to travel to Kilauea Military Camp, conflict between civilian and military travelers was occurring. The terminal used for military traffic was planned for demolition. To keep military and civilian passenger handling separate, the HAC appropriated $3,000 on October 22, 1955 to provide a lanai, office and restroom facilities for us by the military. A private plan hangar, unit 2, was constructed in November 1955 at a cost of $20,000. October 27, 1956 the HAC appropriated $800 for the construction of toilet facilities in the private plane hangars area. A separate passenger terminal for military traffic was completed in 1957 for $3,900. Construction of Taxiway 8-26 and pavement rehabilitation of Runway 8-26 was completed on February 8, 1957 at a cost of $81,955. The HAC authorized the removal of trees creating a hazard in the approach end of Runway 21 in June, 1957. The Commission approved for planning purposes the construction of jet-staging facilities by the Navy at General Lyman Field, the firm coverage to be negotiated before construction begins. On June 30, 1958 the HAC approved the contract awarded for removal of approach zone hazards to meet FAA requirements governing aircraft landing and takeoff operational safety. In the late 1950s, the HAC designated General Lyman Field as the most desirable location to establish a second or alternate airport in the Territory capable of accommodating large jet aircraft. To accommodate overseas service, an extension of Runway 8-26 and expansion of the airport eastward by 200 acres was required. When Congress voted for Statehood for Hawaii in 1959, General Lyman Field became part of the State Airport System of the State of Hawaii, Department of Transportation, and was administered by the Airports Division. On April 24, 1963, grading for the new 9,800 foot jet runway 8-26 extension was completed at a cost of $531,084 but paving, lighting and other work remained. The State’s second jet airport was expected to be ready for dedication by March 1965. It was up to tourist industry leaders to promote the charter flights which would permit this new facility to make its full contribution to the economy. Construction of the second phase of the extension and reconstruction of Runway 8-26 was begun on September 4, 1963 at a cost of $2,191,760. Hilo was the scene of a near-catastrophe when an interisland aircraft rolled off the end of the runway on July 13, 1964, across a road and into a ditch, after landing at General Lyman Field. Several passengers received minor injuries and the plane was declared a total wreck. A crowd of more than 3,500 crowded the airport on February 11, 1965 to greet the first passenger jet direct flight from the Mainland. A Pan American Airways Intercontinental 707 landed at 7:10 p.m. from Los Angeles with a party of 40 persons aboard. In the party were the Board of Directors of Pan Am, their wives and other Pan Am officials. The group was headed by Juan T. Trippe, chairman of the board, and Harold E. Gray, Pan Am president. Dedication of the new 9,800-foot jet runway on March 6, 1965 drew a crowd estimated at 5,000 people. The airport expansion had prepared Hilo to welcome direct flights of commercial jetliners from the mainland. The project cost $2,114,878. At the dedication many of the visitors took time to sign a newsprint roll petition circulated by the Hawaii Island Chamber of Commerce asking the CAB to consider applications by Pan American and United Airlines to fly directly to Hilo from the Mainland. Also in 1965, work was completed on fire and rescue equipment building to house State owned and Air Force aircraft fire fighting units. The new building housed five units. Cost: $30,077. On January 27, 1967, The Civil Aeronautics Board heard testimony on applications from Pan American, United and Northwest Airlines on their proposals to provide direct service from the Mainland to Hilo. Senator Daniel Inouye testified that “a common fare (the same price for a ticket to all points in Hawaii from the Mainland) was not only important to Hawaii County but to all Neighbor Islands. They are growing at a snail’s pace while Oahu is growing in leaps and bounds.” He suggested that a common fare would help to balance the inequity. Direct jet routes to Hilo from the Mainland were approved by the CAB on April 17, 1967 for United, Pan Am and Northwest. If there were no objections the ruling would take effect in 30 days. The airlines could not fly between Honolulu and Hilo, to stem objections from the interisland carriers. Pan Am expected to operate 16 round trips a week from the West Coast to Hilo during peak season and 11 trips in off-season, flying from San Francisco, Los Angeles and Seattle-Portland. United expected to have eight round trips a week from Los Angeles and San Francisco, and Northwest expected four round trips weekly from Seattle and Portland. On May 19, 1967, more than 1,000 Big Islanders welcomed the inaugural of a series of 49 direct charter flights from the Mainland to Hilo by World Airways. Act 217 SLH 1967, appropriated $150,000 for plans for a new terminal complex, and $150,000 for the expansion of the parking lot, alterations of the terminal building and lighting improvements including related equipment. More than 3,500 people were on hand October 1, 1967 to greet the start of direct scheduled flights between the Mainland U.S. and Hilo. United Air Lines touched down at 10:10 a.m. with its DC-8 jetliner with 58 paying passengers aboard. Forty-five minutes later Pan American World Airways’ Boeing 707 glided in with 38 paying passengers. Both flights originated in San Francisco. Under a temporary authorization from the Civil Aeronautics Board, Pan Am offered nine flights a week and United seven a week to and from Hilo. In addition, Hilo had four cargo flights from the Big Island to the Mainland. A common fare permitted round trip passengers to fly between islands for $5 regardless of where they originally landed in the islands. About 40,000 pounds of papayas left for Los Angeles on the first direct United Air Lines jet flight form Hilo. The advent of the new service was a boon to Big Island farmers who previously had to trans-ship Mainland-bound produce to Honolulu. Big Island orchid and anthurium growers were also expected to benefit from direct-flight shipments. On December 13, 1967 Northwest Airlines announced that it would begin twice a week direct flights to Hilo beginning December 17. The flight would carry 165 passengers from Seattle. Pan American beat Northwest by two weeks in providing direct service to and from the Pacific Northwest. However, Northwest’s flight was the first scheduled service to originate east of the West Coast gateway cities. The flight started in New York, with stops in Philadelphia, Cleveland, Chicago and Seattle before arriving in Hilo. Act 40, SLH 1968, appropriated $4.6 million for construction of terminal facilities, utilities and other related improvements, including extension of runway 3-21, and $278,000 to construct terminal improvements, including installation of aircraft apron and auto parking lighting, alterations and additions to public automobile parking area, additions to terminal building and Air Cargo building. Also in 1968, clearing and grubbing for Runway 8-26 was complete at a cost of $69,879. Work began on the $775,000 temporary overseas building at General Lyman Field on November 17, 1968. Act 155, SLH 1969, appropriated $15.92 million for the first stage construction of the new overseas terminal, runway resurfacing and other airport improvements. The new $700,000 interim terminal at General Lyman Field was dedicated on July 4, 1969. The building was constructed to provide temporary relief pending completion of permanent new terminal facilities for both overseas and interisland traffic. Four airlines were awarded routes to Hawaii on July 21, 1969. They were American Airlines, Braniff, Continental and Western Airlines. Pan American and United were already serving Hilo. Braniff began Trans-Pacific service to Hilo on September 1, 1969. Continental followed on September 9, 1969 and Western on November 1, 1969. Hilo’s new air links to about two dozen mainland cities were expected to stimulate both the Big Island’s tourist industry and its exports of fruits and flowers. In 1970 Governor John Burns appointed the Hilo Airport Advisory Committee, composed chiefly of civic and business leaders of the community. Working under the chairmanship of the Airports Division Chief, the committee developed a comprehensive plan for the long-range development of General Lyman Field. Included in the committee recommendations was a proposal for the construction of a new and larger overseas and interisland terminal at a new location to accommodate anticipated growth in passenger traffic through the airport. The new terminal plan, which was the subject of a public meeting on March 23, 1971, called for construction of three one-story buildings on the south side (Puna side) of the existing 9,000-foot main runway. Connected by covered walkways, the three buildings would have 150,000 square feet for passengers’ waiting area, or more than twice the combined space in the existing interisland and the interim overseas terminals. The new terminal would have apron space for 12 passenger aircraft to park, four DC-9 turbojets such as those used by the interisland scheduled airlines, and eight DC-8 or 707 jets. The apron would also be able to accommodate 747 jumbo jets. The $16.6 million expansion plan and related recommendations were submitted by the committee to Governor Burns on May 18, 1971. Governor Burns announced his endorsement of recommendations by the Hilo Airport Advisory Committee for the development of General Lyman Field on August 4, 1971. A principal feature of the plan was a new $16 million passenger terminal. The HDOT announced it favored placing the terminal on the Mauka side of Runway 8-26, the opposite side of Runway 3-21 from the present complex as opposed to the recommendation by the committee for placement on the Puna side. The Airports Division expected to break ground for preliminary site work early in 1973 and to complete the relocated facilities by 1975. To meet this schedule, the airport needed the FAA’s approval of the environmental impact statement by the end of the 1972 calendar year. One of the recommendations of the advisory committee was that when new runways were needed, they should be constructed to orient flights away from the populated areas of Hilo. When a longer runway would be needed, Runway 8-26, the main runway, should be extended east by 2,200 feet to provide a 12,000-foot runway, the committee urged. It was also recommended that only minimum improvements be made to the existing terminal facilities pending their replacement. Construction of the new terminal was delayed by the necessity of Federal approval of environmental impact statements and ground was finally broken for the project in July 1974. General Lyman Field was designated as the South Hawaii District and the former Hawaii District Airport Manager became the South Hawaii District Superintendent on October 1, 1970. The first 747 jumbo jet to land at General Lyman Field arrived on February 6, 1971. It was a Braniff International flight bringing a tour party of about 130 persons and a score of travel agents. Its arrival attracted a crowd estimated at more than 2,000 persons. Scheduled service by 747 into Hilo was not contemplated in the current expansion proposal, but more special flights by jumbo jet were expected as the Big Island’s charms became more widely known. The FAA began to implement the Airport and Airways Development Act of 1970 under a plan entitled the Airport Certification Program. Under this program, every airport serving air carriers certified by the Civil Aeronautics Board must maintain certificates from the FAA to remain in operation. This program imposed an entirely new system of inspections, record-keeping and reporting on airports and required additional funds and personnel to meet its stringent requirements. The FAA also published a “Notice of Proposed Rule-Making on Aviation Security” and began to implement an airport security system. This new program meant new obligations for the Airports Division and required new equipment expenditures and personnel increases. Hilo International experienced a boom in air cargo as a result of the West Coast dock strikes of July 1, 1971 to October 9, 1971 and from January 17, 1972 to February 19, 1972. From July 1 to September 30, 1971 cargo increased 485.4 percent. Overseas airlines began suspending or reducing Hilo service and on February 1, 1972 a significant revision in air tariffs became effective through removal of the Maui Fence. As a result of this revision, a round-trip ticket-holder no longer had to arrive in Hilo and depart from Honolulu, or vice versa, in order to receive reduced fares for certain interisland flights. On June 23, 1972 General Lyman Field received a fire and rescue vehicle with a carrying capacity of 3,000 gallons of water and 500 gallons of foam concentrate. Added to the 1,500 gallon unit already in use, the new equipment brought the airport up to the new standards for airports handling the largest of overseas air carriers. A quick-response rescue vehicle was ordered for General Lyman Field. The vehicle could transport the fire chief, break-in tools and fire suppressant chemicals to a crash within three to four minutes, while slower equipment was still on the way. The vehicle carried 500 gallons of water, 55 gallons of foam concentrate and 500 pounds of dry chemical. In Fiscal Year 1972, scheduled overseas passengers decreased 16.3 percent from the 1969 FY when direct service began to Hilo. However, interisland traffic increased 21 percent. In December 1973, the state and airlines reached an agreement on the extent of the new terminal. An $8.3 million contract was awarded for the site work, grading, drainage and paving of the aircraft apron, terminal site, parking lot and access road and for the utilities for the new facilities on June 12, 1974. Act 195, SLH 1975, appropriated $6.6 million for airport expansion and $2.7 million for design and construction of a new terminal facility. As of June 1975, the General Lyman Field staff consisted of a Security Section, Visitor Information Section, Crash Fire Section and General Maintenance Services section. The Security Section consisted of three Hawaii County police officers who served on a reimbursable basis. The security obligations of the airport under FAA requirements were satisfied by the employment of contractual security services which used especially trained and deputized law enforcement officers as described in FAA Regulations, Part 107. The Crash Fire Section was comprised of three county firemen, serving the district on a reimbursable basis and 20 volunteers who were paid for drill attendance and emergencies. Total manpower authorized for the airport was 42. Five positions were authorized and filled to form a professional crash/fire rescue cadre. The FAA Control Tower operated 24 hours per day. The new passenger terminal was dedicated and opened on April 30, 1976. It was equipped with flight information displays, signs and new furniture. The old terminal was kept in service, thus greatly enhancing General Lyman Field’s capacity. Phase III was completed. Cost: $2,892,404. General Lyman Field was the site of a series of demonstrations by Hawaiian groups in 1978 protesting the use of Hawaiian Home Lands for the airport. Protectors blocked the airport access road with slow moving vehicles for several hours and caused some passengers to miss their flights. On Labor Day, September 4, 1978, the group broke through a security gate and marched into the airfield area. The airport was closed for about 40 minutes with one Aloha and one Western Airlines flight diverted to other airports. The dispute centered around 91.595 acres of Hawaiian Home Lands that was to have been exchanged for other state lands in 1958 for the construction of Runway 8-26. The exchange was never consummated and the Hawaiian Home Lands Department demanded rental payment from the Airports Division for the use of the land. The airlines filed a complaint against the department protesting the validity of a proposal to pay the Department of Hawaiian Home Lands an annual rental of $633,000 for the land. The airlines were paying under protest into an escrow account six cents per thousand pounds of their landing fees in the event agreement was reached on the annual rental claimed by the DHHL. The two sides were not close to settlement. The problem of improperly transferred lands from DHHL included not only General Lyman Field, but also Molokai Airport and Waimea-Kohala Airport. In addition, Federal funds amounting to $4,942,038 were being withheld for past projects completed at General Lyman Field and Molokai Airport until the state could prove it had clear title to all airport lands at these locations. In January 1979, citing economic concerns, Continental Airlines ceased service between the mainland and Hilo, ending 10 years of association. Along with regular passenger service, Continental carried one million pounds of cargo each month. Five months later, United Airlines announced that it would also cease direct flights out of San Francisco. The new 105 foot high FAA Traffic Control Tower opened on November 2, 1979. It housed the FAA Communication systems within the tower and provided safety related services for the airport. During Hurricane Iwa in November 1983, national and international flights were diverted to General Lyman Field. A new interisland carrier, Mid Pacific Airlines, began serving Hilo in 1984 and United Airlines announced it would revive its daily nonstop service from Los Angeles. Updating the Master Plan was started and completed in 1988. Noise maps were developed which described levels of disturbance by aircraft on areas adjacent to the airport. Federal standards for noise measurement and description are prescribed in Federal Aviation Regulation Part 150 and used to create the noise maps and establish guidelines for appropriate land use compatible with airport activities. Known as Part 150 Studies, the projects involved public information meetings to discuss findings and alternative remedial actions that could be taken to reduce noise conflicts. In addition to providing relief for neighboring communities, the program assists in assuring that the long-range airport system will meet the needs of the state and local public served by each airport. State and County planners, as well as affected property owners, have a basis for assessing the noise impact and deciding the appropriate land use around airports. In addition, the state began updating the Statewide Airport System Master Plan which forecasts movements of passengers and cargo by air into and throughout the State. Act 59, SLH 1989, changed the name of the airport to Hilo International Airport effective July 1, 1989. The Act named the passenger terminal “General Lyman Terminal” in memory of Brigadier General Albert Lyman, the first person of Hawaiian ancestry to attain such rank in the United States Army. A display case was constructed for General Lyman memorabilia and plaques in July 1992. The terminal was rededicated to General Lyman on September 19, 1993. Construction was completed on a new Aircraft Rescue and Fire Fighting Training Facility in November 1993. This provided the facilities for the ARFF drills required by the FAA. Cost: $2.5 million. Eight T-hangars were constructed for light aircraft in January 1994. Cost: $1.1 million. The University of Hawaii at Hilo and the Honolulu Community College announced plans to open a pilot training center at Hilo International Airport in 1994. Cruise ship passengers added a new dimension to Hilo air traffic in 1998 with about 100,000 passengers and 40,000 crew members making their way through ITO. In 1999 the cultural theme developed for Hilo International is Pele: The Fire Goddess. This theme was implemented using wood panels and a kapa border/pattern throughout the airport. An update to the Master Plan to 2015 was published in January 2000. A Noise Compatibility Program document was also completed. The plan reported that the existing single runway was expected to provide sufficient capacity to the year 2015 based on projected demand. Phase I (1998-2003): Waste Water Treatment Plant, Fuel Farm Site Preparation, GA Fuel Storage System Site Preparation, Air Cargo Building III, Postal Facility Site Preparation, Roads P and M (O`opu Street) and Phase II of parking improvements. Airside improvements include itinerant airline aircraft parking, Ramp K, the Overseas Terminal apron and gates, and a new Air Traffic Control Tower. Estimated cost: $46.6 million. Phase II (2004-2009): a new overseas terminal, air and water quality monitoring, electrical distribution and emergency generator, flight kitchen site preparation, ground transportation lease lots, GA site development and hangars, air tour terminal, heliport Phase I, Ramp L, FBO sewer and lift stations, Road N South (Pao`o Street) and a rock quarry. Estimated Cost: $72.24 million. Phase III (2010-2015+): long term improvements that require reassessment in the 2002 Master Plan. Major projects include: Connector Road L, Long Term parking, DOT/DEA Administration building, Keahole to Kawaihae Fuel Corridor. Estimated Cost: $11.9 million. On November 19, 2001 Congress passed the Aviation and Transportation Security Act which established the Transportation Security Administration (TSA). TSA now oversees all transportation security including airport security checkpoint screening, previously managed by the airlines. In July 2002 the Hilo International Airport Master Plan was published. Land should be acquired west of Kanoelehua Avenue for a Runway 3 runway protection zone, avigation easements for the Kanoelehua Industrial area and for Runway 3 protection zone; exchange runway 21 runway protection zone property, and acquire the triangular area east of Kanoelehua avenue, at a total cost of $3.5 million. Sound attenuation of residents and public facilities were needed as part of the noise mitigation program, $14.625 million. In the terminal area complex, $34.4 million was programmed to develop new cargo buildings, aircraft parking apron, roadway and other improvements; covered air cargo marshalling area in the passenger terminal complex; construction of new helicopter facility, lease lots, access road and utilities; development of the general aviation parking apron, lease lots and utilities; and construction of t-hangars. A sum of $4 million was planned for expansion of the parking lot for public and employee parking, expansion of the airport baseyard, improvements to the Kanoelehua intersection and emergency access road, paving of the emergency access road to Runway 26, extending the perimeter fencing around new property and relocation of the NWS balloon launch facility and office. In Phase II (2006-2010), the master plan included $19.8 million for sound attenuation, construction of a T-hangar, expansion of the passenger terminal parking lot, paving the perimeter road along the north side of the airport, paving the emergency access road to extended Runway 26, installation of an aircraft wash rack, extension of the perimeter road around the east end of the airport, extension of the service road to Airport Industrial Area, relocation of the FAA Remote Transmitter Site, replacement of the existing fencing around the east end of the airport, and extension of the fencing around the east end of the airport. In Phase III (2011-2020), master plan improvements of $24 million were planned: Extension of Runway 8-26 to the east, extension of parallel Taxiway A to the east, relocation of “Runway 8 threshold to the east, construction of Runway 26 blast pad, expansion of the cargo apron, holding aprons for Runways 8 and 26, new entry/exit Taxiway F for Runway 8-26, extension of runway safety area for Runway 21, overlay runway 3-21, and construction of Runway 3-21 blast pads. New navigation aids included extension of high intensity runway lights to the east, and medium intensity taxiway lights to the east; relocation of the ILS, MALSR and Middle Marker on Runway 26, relocation of VASIs on Runways 8 and 26, relocation of distance to go markers on Runway 8-26, relocation of ODALS on Runway 8, and installation of MITL for Taxiway F extension, and the south end of Taxiway C, distance to go marker son Runway 3-21 and PAPI on Runway 21. The plan also included construction of additional T-hangars, the extension of the service road west of the Airport Industrial Area, expansion of the passenger terminal parking lot and improved access from Kanoelehua Avenue to the old terminal area. Security issues remained a primary concern. The TSA and the airport continue their partnership to improve the passenger checkpoint and baggage screening process without adversely impacting the passenger flow. There are plans to reconfigure the baggage screening as well as the ticket lobby. The baggage screening equipment currently located in the ticket lobby will be relocated behind the walls and integrated with the conveyor system. This will relieve the congestion in the ticket lobby and the baggage screening portion of the check in process will appear seamless to the passengers. In 2010, Hilo International Airport was served by two interisland carriers, two commuter airlines, and several aerial sight-seeing tour companies. It no longer had scheduled Trans-Pacific service.